Ex-student of Moscow university convicted of attempt to join ISIS seeks parole | Russian Legal Information Agency (RAPSI). 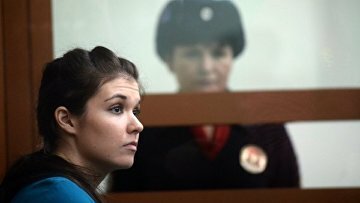 MOSCOW, March 26 (RAPSI) - Varvara Karaulova (Alexandra Ivanova), ex-student of the Moscow State University sentenced to 4.5 years in prison for attempting to join the Islamic State (ISIS) militants in Syria, has filed a petition for parole, according to her attorney Sergey Badamshin. The Vologda City Court will consider her motion on April 16, the lawyer wrote on his Facebook page on Tuesday. The second-year student of the Moscow State University’s Faculty of Philosophy decided to join ISIS, a terrorist organization prohibited in Russia, and secretly started off for Istanbul on May 27, 2015. Karaulova, who later changed her name to Alexandra Ivanova, was arrested on June 4, 2015, near Turkey's border with Syria along with 13 other Russian citizens when attempting to cross into the territory occupied by Islamic State terrorists. In October 2015, she was put in jail. She pleaded not guilty. In October 2016, Karaulova was expelled from the university. In December 2016, the Moscow District Military Court found that Karaulova decided to participate in the Islamic State terrorist group’s activities. The court noted that she shared organization's ideology. Karaulova was given a 4.5-year prison term. On March 22, the Russian Supreme Court upheld the sentence. 11:47 26/03/2019 Varvara Karaulova (Alexandra Ivanova), ex-student of the Moscow State University sentenced to 4.5 years in prison for attempting to join the Islamic State (ISIS) militants in Syria, has filed a petition for parole.